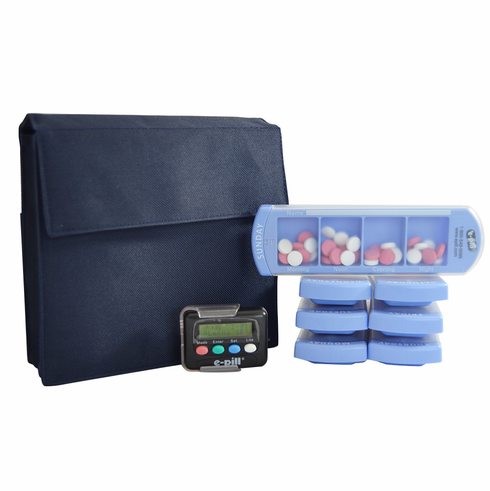 Simple to Use, Discreet, and Durable Pillbox Reminder System. This weekly organizer is a convenient & compact storage pack made of durable high-quality canvas. It includes 7 easy-to-open pill boxes with the respective day of the week clearly imprinted on the front of each one. Each Pillbox has a capacity of 25 aspirin-sized tablets. This set also includes the e-pill Pager, a small timer that beeps and vibrates. The timer allows the patient to set up to 12 Daily Alarms that automatically reset every day.